To Cite: Nikouei F, Rastegar K, Andalib A, Sabbaghan S. A Symptomatic Displaced Os Odontoideum: A Case Report, Shafa Ortho J. 2016 ; 3(2):e4785. doi: 10.17795/soj-4785. Introduction: Os odontoideum (OO) is a form of odontoid anomaly presented by a separate ossicle with a smooth, sclerotic border not fused with C2 body. The current paper reports a boy with irreducible displaced os odontoideum with severe neurologic deficit after a minor trauma. Case Presentation: A 16-year-old boy admitted in the center due to neck pain and torticollis with neurologic deficit. He had a history of multiple minor traumas. Advanced imaging assessment demonstrated displaced os odontoideum with minimal space available for cord (SAC) and myelomalacia. After unsuccessful closed reduction a 2-stage operation was planned: first, the anterior transoral release and odontoid resection with subsequent halo-traction and second, the posterior atlanto-axial instrumented fusion with bilateral C1 hook and C2 pedicular screws. Conclusions: Congenital anomalies of the odontoid are associated with C1-C2 instability that can be subluxated or dislocated with minor trauma and cause permanent neurologic deficit or even death. 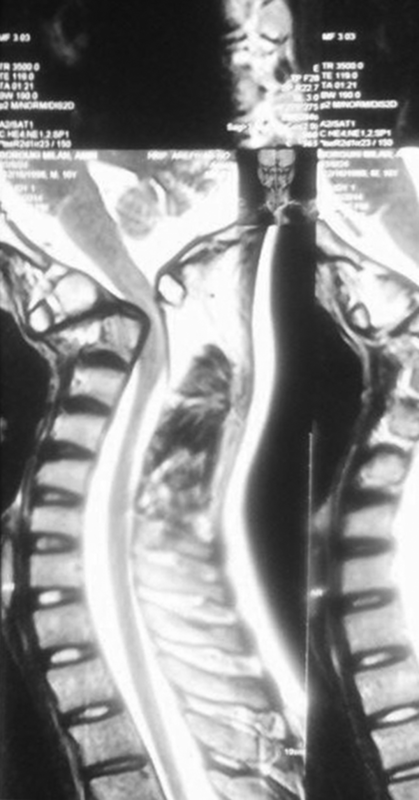 When acute cervical spine trauma is imaged, os odontoideum should be distinguished from an acute dens fracture with a multimodality imaging approach including computed tomography (CT), magnetic resonance imaging (MRI) and radiography. Here is the report of a rare case with irreducible displaced os odontiodeum treated him with anterior release, odontoid resection and posterior C1-C2 instrumented fusion. Os odontoideum (OO) is a form of odontoid anomaly; other forms of this anomaly are aplasia and hypoplasia (1). The os odontoideum is a separate bone with smooth, rounded cortical margins, usually about half the size of the odontoid process. The gap between the os odontoideum and the second cervical vertebra (the axis) is wide and lies above the level of its superior facet (2). Since this lesion is frequently asymptomatic and remains undiscovered until it is brought to the physician’s attention by trauma or the onset of symptoms, the exact incidence of os odontoideum is unknown, but it is probably more common than estimated. Minor trauma can cause rapid deterioration of neurological function in asymptomatic patient with danger of serious consequences and even death (3). It is reported that odontoid anomalies are more common in patients with Down syndrome, Klippel-Feil syndrome, Morquio syndrome and spondyloepiphyseal dysplasia (1). The odontoid process projects superiorly from the body of the axis and begins to ossify between the first and fifth months of prenatal life. Its tip arises embryologically from the fourth occipital sclerotome along with the occipital condyles and the rim of the foramen magnum (4). This separated ossification center, called ossiculum terminale, appears at the age of three years and fuses by twelve years. These synchondroses between axis and base of odontoid are potentially weak areas susceptible to traumatic disruption and in many manuscripts describe physeal separation. This abnormality frequently leads to atlantoaxial dislocation (AAD). Most of these dislocations are reducible and in a minority, atlantoaxial dislocation might be missed and gradually become irreducible (IAAD) and this form is a considerable challenge for the spine surgeons (2). The current report is on a rare case with os odontoideum displaced with a minor trauma and referred to the center with severe myelopathy. The ethical board approved reporting the case of a sixteen-year-old boy who fell off the bicycle eight months ago. He had been visited in the emergency department of a local hospital and after physical examination discharged; then two weeks before admission in the center he fell off the bicycle again and was hospitalized due to neck pain and torticollis and equilibrium impairment. In the past months he had several episodes of spontaneous falling down with upper and lower limb tingling. The patient had not experienced unconsciousness and the neurological examination revealed that finger to nose test was impaired and he had positive Romberg test. Deep tendon reflexes were exaggerated. 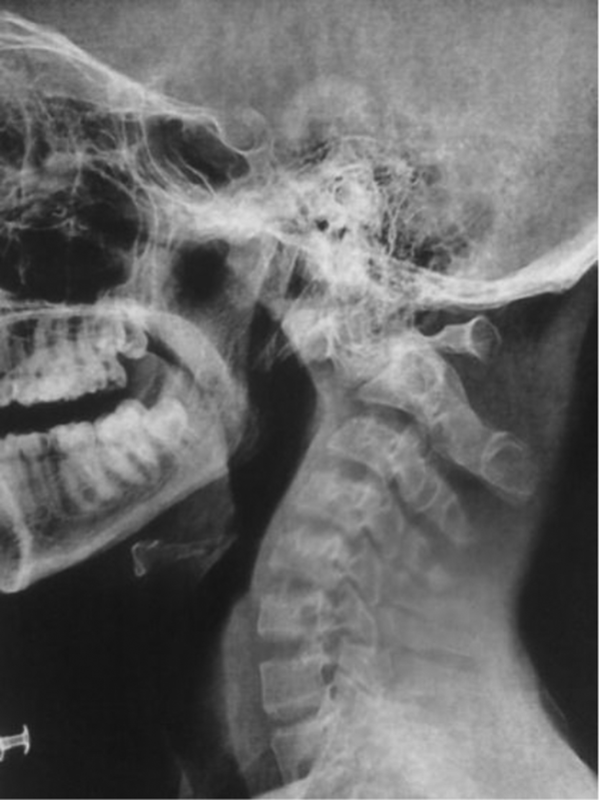 Initial anteroposterior and lateral radiographs of cervical spine revealed a non-anatomic odontoid process (Figure 1). Computed tomography (CT) scan demonstrated displaced os odontoideum with the space available for cord (SAC) less than 10 mm (Figure 2) and myelomalacia was observed in magnetic resonance imaging (MRI) (Figure 3). In the CT scan, there was no contact between odontoid process and body of axis(C2) in sagittal cut and it was displaced to anterior completely. The border of fracture site was sclerotic and not fresh. According to these imaging and the clinical presentations, displaced os osontoideum was diagnosed, halo-traction was applied, skeletal traction was started and the patient was checked clinically and through radiography. No reduction was observed after three days of incremental skeletal traction and the patient was scheduled for anterior decompression with transoral approach. He was transferred to the operation room with halo ring and then after general anesthesia authors passed a Nelaton catheter into a nostril, and sutured it to the uvula. Traction was applied to the catheters to stretch the uvula and soft palate out of the surgical field, then a McGarver retractor was inserted into the mouth to open and retract oropharynx prepared with povidone-iodine (Betadine) and then the posterior pharyngeal wall was infiltrated with epinephrine solution (1;500000 concentration) to prevent excessive bleeding. After palpation of the anterior ring of C1 under the posterior pharynx, the incision was done in the wall of the posterior pharynx from the superior margin of C1 to the top of C3. 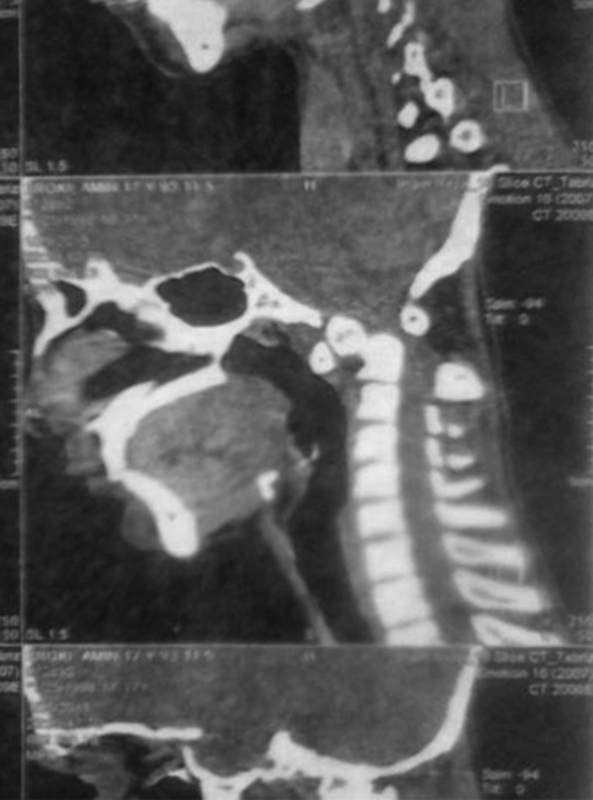 Then with high speed burr the anterior ring of C1 was removed, displaced odontoid was resected, the cord was decompressed and the patient was transferred to intensive care unit (ICU) with halo-traction (Figure 4). In early postoperative radiography, displaced odontoid was not reduced but with continuation of skeletal traction odontoid was reduced and posterior atlantodens interval (PADI) was restored. 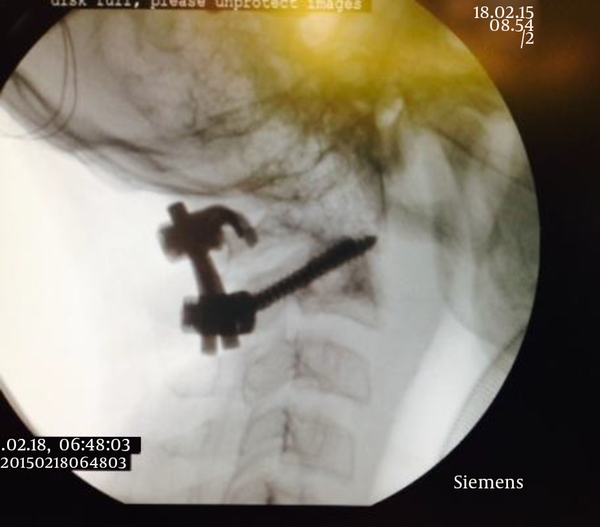 One week after anterior decompression, the patient was operated for C1-C2 fusion (bilateral C1 hook and C2 pedicular screws) by posterior approach and was discharged with a Philadelphia collar in good condition (Figure 5). After one year post surgery, the patient had normal gait without any significant neurologic deficit (Figure 6). The recent developments on advanced imaging techniques (high-resolution CT scan and MRI) allow more accurate examination of the upper cervical spine in children. However, whether the origin of an os odontoideum is congenital or acquired (posttraumatic) remains controversial (5-13). Fielding et al. reported that nine patients subsequently developed os odontoideum despite normal post traumatic X-rays (5). The evidence suggests that a missed fracture and then subsequent odontoid osteonecrosis might be the cause of os odontoideum. The important point in congenital anomalies of the odontoid is an already abnormal C1-C2 instability that can be subluxated or dislocated with minor trauma and cause permanent neurologic deficit or even death (13). Patients with localized symptoms such as neck pain usually improve with conservative treatment (traction or immobilization) (1). The common indications of surgical treatment are 1) neurologic deficit (even transient), 2) anterior or posterior C1-C2 instability more than 5 mm, 3) progressive C1-C2 instability and 4) persistent local symptoms (neck pain, torticollis, etc.) not relieved by conservative treatment (1). 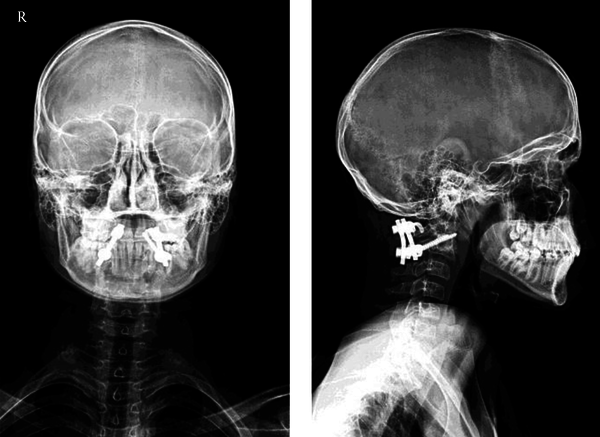 Robson reported the case of a 22-year-old female referred to the emergency department, after a martial arts exercise, with transient weakness and numbness in all extremities referred to the neurosurgery division for atlanto-axial fusion (14). Numerous surgical techniques are described for this rare anatomic disorder. Reilly and Choit described their practice with posterior C1-C2 transarticular screw fixation for pediatric C1-C2 instability (15). Brecknell and Malham reported three cases of os odontoideum treated surgically with posterior C1-C2 fusion with polyaxial screw/rod fixation (16). 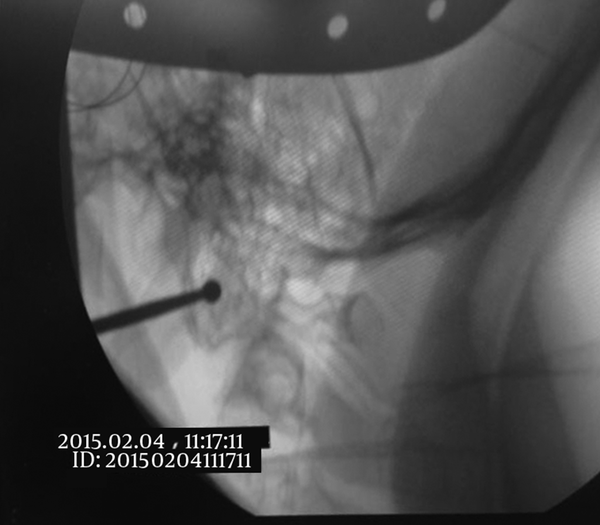 A few reports on out surgical management of patients with irreducible atlantoaxial dislocation (IAAD) are available. Ai et al. described a one-stage transoral technique for IAAD. In this technique after resection of articular capsule and scar tissues inside the atlanto-axial facet, reduction and fixation was achieved with transoral atlantoaxial reduction plate (TARP). This plate was fixed by bilateral anterior C1 lateral mass and C2 pedicular screws (17). Another single stage method in IAAD was reported by Chang-Wei et al. that is posterior rotating rod. In this method, C1-C3 lateral mass and C2 pars screws are inserted, then a curved rod with its convex side posteriorly are placed and nuts are tightened loosely. Then both rods are simultaneously rotated till the rod is in lordotic position (18). Yin et al. described their experience in reduction of IAAD by single stage posterior facet release and fusion with C1 lateral mass and C2 pedicular screws (19). Generally, in patients with no neurologic deficit, in situ posterior fusion can be performed with no significant risk, but in patients with neurologic deficit the first step is skeletal traction and after reduction, atlantoaxial fusion should be placed. Sometimes skeletal traction fail and reduction is impossible, under such circumstances decompression or release can be done anteriorly or posteriorly (1). Authors approached the patient urgently, because of significant neurologic deficit, planned a 2-stage procedure; anterior release and odontoidectomy and halo-traction followed by posterior C1-C2 fusion with bilateral C1 hooks and C2 pedicular screws. A week after the final surgery the patient was discharged in good general condition and nearly normal walking ability. Authors’ Contribution: Study design: Farshad Nikouei; manuscript preparation and revision: Farshad Nikouei, Khodakarm Rastegar, Saeed Sabbaghan and Ali Andalib; study supervision: Farshad Nikouei.